A puffin chick has been spotted on an island off the north Devon coast for the first time in more than 30 years. Lundy is one of only a few places in England where puffins are found and the island's name actually translates as Puffin Island in ancient Norse. 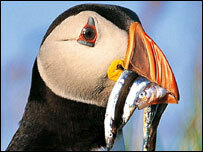 In 1939 the island had about 3,500 puffin pairs. But by 2000 the number had fallen to just 10 pairs. 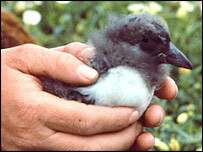 The puffin chick is a sign of success for the Seabird Recovery Project, which has been running since 2002. The main aim of the joint project by English Nature, the National Trust, Royal Society for the Protection of Birds (RSPB) and the Landmark Trust, which owns Lundy, was to eradicate the island's rat population - which was believed to be responsible for the decimation of the puffins. Last month, the RSPB said the island appeared to be free of rats for more than a year and some puffin burrows had been occupied. Leigh Locke from the RSPB said: "They're a very important species in their own right and they're very scarce. "Because they're susceptible to predators, they're really limited to offshore islands. So here in Lundy we have the potential to build a big colony. "Aside from the conservation argument, they're an amazing, charismatic species and most people, even if they're not interested in bird watching, will know what a puffin looks like. "They're entertaining and comical, and children love them." The puffin chick was spotted by Ben Sampson, the island's warden. He said: "The youngster had very little, if any, down left and I'm sure it was very close to fledging. "This is the first recorded puffin chick since 1972 and I'm really excited to be the one to have spotted it." The RSPB estimates it will take about 10 to 15 years to get the birds back to big numbers, but it says the sighting of the chick means the first steps of the process have been taken to secure the long-term future of puffins on Lundy.